For those seeking a ring that is more unique than the classic round solitaire, a princess cut engagement ring is a popular option. This cut is distinguished by its square shape, a result of mixing both the classic step and brilliant cuts to design the stone. The combination of these cuts gives a princess diamond approximately fifty facets, less than a classic round cut, but more than a rectangular emerald cut. Princess cut engagement rings are one of the most common styles for modern brides-to-be and finding a good quality ring is easy. Depending on the size, quality of the stone, ring metal, and extra detailing, a princess solitaire engagement ring may cost from $200 to $10,000 or higher. 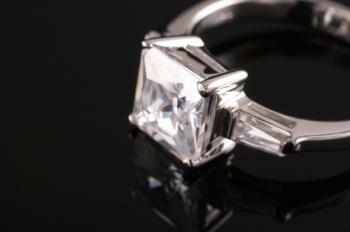 A princess cut solitaire may be set parallel to the ring band, or it may be set at an angle to create a diamond shape. Prong styles also vary, from cathedral settings to classic Tiffany settings, or a solitaire could be set lower in the ring with a tension or bezel setting. The choice of metal can help create a unique solitaire design. Princess stones are frequently set in platinum or white gold to enhance their sleek, modern look, though yellow gold is also popular. Another option is to choose a multi-tone engagement ring that uses different metals to create a unique design without additional gemstones. The Tiffany Princess is priced just under $11,000. 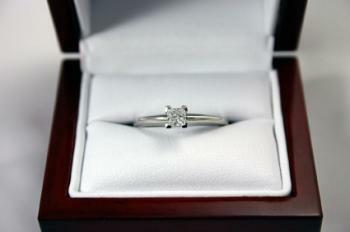 It is done in a streamlined platinum band and features a one-carat princess cut diamond. The Diamond Solitaire Engagement Ring, from Littman Jewelers, features a 1/3 carat princess cut diamond set in yellow gold. It is priced under $600. Another common setting for princess cut engagement rings is to use is a channel setting, where the stones are set into the band itself rather than held above it with prongs. Because the stones are square, several of them can be aligned together without any gaps between the stones, creating a shimmering line of diamond fire. This is especially popular for wedding bands in bridal sets as well as men's wedding bands. The Chloe Ring, from Gemvara, is an eye-catching ring set in platinum. It features a large center diamond and channels set princess cut stones along each side of the band. 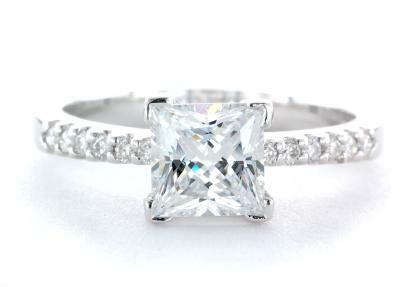 The Channel Set Princess Ring, from Blue Nile, gives you the option to choose the center princess cut diamond. Done in 14K white gold, this ring features 12 channel set diamonds along each side of the band. Princess cut engagement rings are frequently set with additional stones for added brilliance, with a total of three stones being the most popular variation. 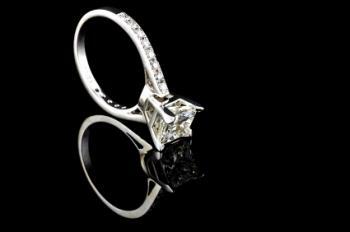 Rings can be done in various designs using smaller princess cut diamonds, emerald cuts, or even baguettes. Of course, all diamond engagement rings are customizable, and round, pear, and other diamond shapes can be used as accents as well. The Ariel Ring, from Gemvara, is set in 14K white gold and features three stunning princess cut diamonds done in a stylish design. The Princess Cut Past Present Future Ring, from Zales, is done in white gold. It features three princess cut diamonds, each with a halo of smaller diamonds. The band is split shank and also features channel-set diamonds. A princess cut diamond can be used as the center stone and colored gemstones as accents. This design showcases the center diamond and offsets it in a unique way. Diamonds mixed with gemstones such as sapphires, rubies, blue topaz and amethyst are becoming more popular choices for engagement rings. Caroline Ring, from Gemvara, is set in 14K white gold and features a stunning princess cut center diamond and two amethyst accents. Diamond and Sapphire Ring, from Kay, features princess cut center diamond surrounded by pave set round diamonds. The center mount is flanked by two, princess-cut blue sapphires. This gorgeous three-stone setting is set atop a vintage-looking band that features more pave-set diamonds on the top and sides for a sophisticated look. Tiffany & Co. features stunning luxury princess cut solitaires. Most designs are priced around $10,000 and up. Littman Jewelers carries a wide selection of solitaire engagement rings with princess cut diamonds. Princess styles can be found in a range of prices from $600 to $7000 and up. Gemvara features an array of rings from classic solitaires to those that combine diamonds with other gemstones. Most rings are prices between $2000 and $8000. Blue Nile gives you the option to choose rings from their inventory or to pick your own stone and create a unique design. Depending on the diamond and metal you choose, rings range from under $1000 to over $7000. Engagement ring price varies according to many factors, not just the cut and size of the center stone. 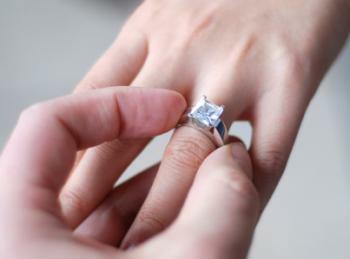 Because many princess cut engagement rings are set with additional side stones, the total carat weight of all those stones is added to formulate a final price. While a princess cut may at first seem a more economical option, adding numerous accent stones can drastically increase the price. The square, classic shape of a princess cut diamond can make an extraordinary engagement ring, whether by itself or set with additional stones. Available in many settings and with a wide range of design options, any bride-to-be is sure to feel like a princess with such a vibrant ring reflecting the sparkle in her heart.